In maps from the early twentieth century, along the south side of Peldon's Lower Road, there are only five houses, Brickhouse Farm, Brickhouse Cottage next door to the farm, Honeysuckle Cottage, Games Farm and The White House (now Sampton Wick). Three farms and two cottages. The name of Honeysuckle Cottage was first used in the 1970s when a couple called Mr and Mrs Avis moved into the house; at the same time they bought an extra parcel of land from the farmer to extend the length of the garden, the farmer at the time was Bill Bruton and the field belonged to Games Farm. 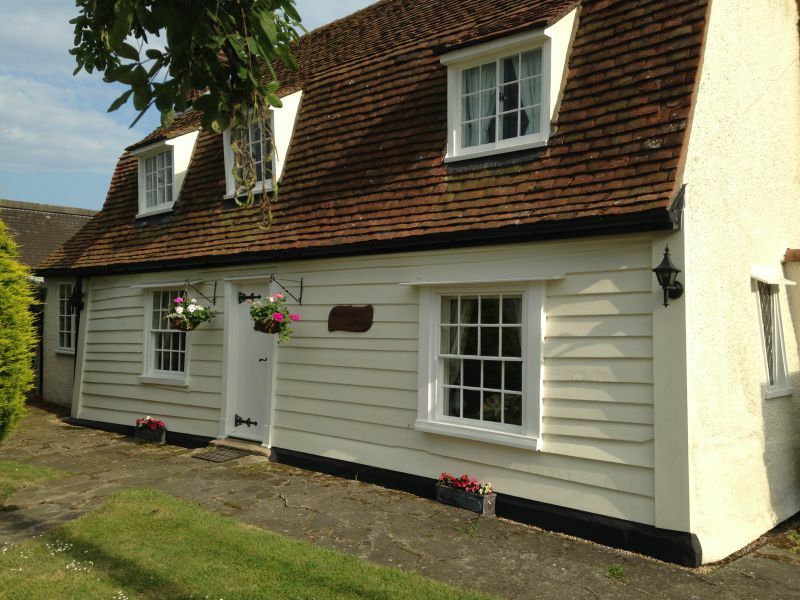 Prior to the name change, the cottage had been known as 'The Olde Home' but in the oldest documents for the house, (indentures and wills), the earliest of which dates to 1790, the house is given no name. In this period the 'chain of ownership' for the previous 125 years had to be given as proof of title. In the legal documents for the cottage, a list of previous inhabitants is given thus enabling the historian to discover the inhabitants of the house for the last 300 years or more! The length of time one had to go back to get a good "root" of title to unregistered land was slowly reduced from 125 years over a period of years. The 1925 Property Act started the process, and amendments to the Act over the years have reduced the period to 15 years. Mid C18 cottage. Timber framed and plastered, with weatherboarded front. Red plain tile gambrel roof. One storey and attics. Two window range C18 double hung, vertical sliding sashes with glazing bars. Three catslide dormers, with horizontal sliding sashes with glazing bars. End chimney stacks in red brick. It has been possible to put together the following list of owners/occupiers from documents in the possession of the current owner. Details of some of those occupants have been gleaned from the Ancestry website and from newspaper cuttings from the 1930s and 40s. Copies of the Parish Magazines of Peldon and the Wigboroughs published in the 1970s and 80s have been a source of information in more recent times. From a note by the late Ann Watkins, included in the cottage's documents held by the current owner, she wrote that she believed the cottage dates to about 1650 and that tithe duty was paid on it. She also believed the cottage to be a 'waste cottage' ie a cottage built on the 'manorial waste' or common land. George Browne, yeoman, is the earliest occupant of Honeysuckle Cottage mentioned. There is a George Brown listed as Churchwarden of St Mary's, Peldon, in 1704. It is likely this is him and that he was born mid to late 1600s. As a yeoman he was a farmer who owned land; yeomen were considered to be one step down from the gentry classes. It is possible that he was in fact responsible for building the cottage. In the 1763 list of Freehold names (see below) Samuel is listed as owning land in Peldon and therefore eligible to vote. He is also listed in 1774. His marriage to Mary Pearson from Abberton appears in the Parish Register for 7th January 1778. As a husbandman, he was a small landowner and farmer. Sarah Linnett did not live in the property, the bond states she lives in Colchester. However, since her uncle, Samuel Browne, died intestate she became 'Heiress at Law'. From a bond dated 1790 it would appear that she is selling Honeysuckle Cottage plus another property in Peldon, a 'New Erected Brick'd Messuage', to wealthy landowner, Samuel Bullock from whom she has received a £100 loan. He requires her to sign an indemnity in order that the obligation to pay an annuity to the widowed Mary Browne will not fall to him. Sarah Linnett undertakes to make a payment to her aunt of 2 guineas a year for life and Mary may stay in the property and enjoy any rents as long as she lives. Mary Browne nee Pearson, widow of Samuel, presumably lives in the cottage following his death in 1790. It appears Samuel did not live in the cottage, he was a wealthy property and land owner in the area. 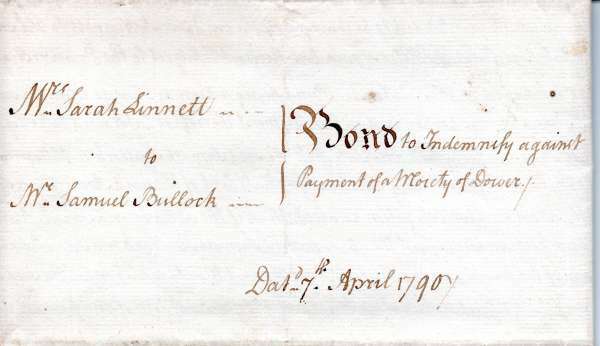 That he was the owner of Honeysuckle Cottage is indicated by the documents, including this 1790 bond above and his will, being kept among all the other legal papers for the cottage. The Bullock Family first came to the area in the late 16th century, moving into Moulshams Manor at Great Wigborough; with connections to Great Wigborough for over three hundred years the family warrants a study all of its own. In the 1763 list of Freehold names Samuel is listed as owning land in Peldon and therefore eligible to vote. (There are two Samuel Bullocks listed, presumably one is his father). Probate is granted to Samuel's executors on 6th November 1814. He appoints three friends as executors, John Wilkin of Inworth, John Cooke Spurden of West Mersea and Edward Harvey of Great Horkesley. He wills that all his properties in Peldon and Great and Little Wigborough are to be sold which no doubt included Honeysuckle Cottage. Having outlived his wife and most of his children, at the time of his death he has one married daughter still living and several grandchildren. He also leaves money to enable his workers' wives to buy black clothes to attend his funeral and leaves two shillings to each widow in the village to be distributed at his funeral. Samuel and his family are buried in a table top tomb in the churchyard of St Marys, Peldon. Simon Ruse Simon Ruse married Hannah Boley in Peldon on 1st August 1815. [His son, Simon Boley Ruse, who was born in 1815 in Great Wigborough, at the age of 41 takes an assisted passage to Australia with his family in 1857 on board the ship Alfred. Simon Boley Ruse died in New South Wales in 1875]. James Peachey husbandman was born in 1786 in Inworth and on 25th May 1812 married Sarah Pewter, a widow (1787 - 1871). Sarah Peachey. In widowhood she seems to live in the cottage with William Smith. It is not clear what relation William was to Sarah. She was a widow from 1860 and died in 1871. The Peacheys' son, John, sells the cottage in an auction at The Plough Inn, Peldon, on 4th August 1871 for £84. John Wright was the highest bidder. John Wright Born about 1807 he appears in the 1851 census; he is 43 and a farmer of five acres in the Colchester Road. In the 1871 census aged 64 he is listed as a farmer of 102 acres employing 6 men and 1 boy. He was born in Great Wigborough. His wife Sarah is 62 in the census and was born around 1809 in Fingringhoe. They have a daughter, Lavinia aged 22 born in Peldon. The census states farmhouse licensed to sell beer, this farmhouse appears to be close to Peldon Hall. John Wright dies on 12th January 1878. He appoints his son, John, and wife, Sarah as his executors and wills that Sarah can live in the cottage during her lifetime, then his properties are to be sold at the best possible price. Sarah Wright widow of John died on the 15th May 1892. John Wright farmer at Little Wigborough son of John and Sarah Wright sells the cottage according to his father's will. In an indenture between John Wright, son of the late John Wright of Little Wigborough farmer and Joshua Cudmore of Peldon made on 1st October 1892 the description of the cottage with the chain of ownership is given thus. All that messuage or tenement with the yard garden hereditaments and appurtenances thereto belonging situate in Peldon aforesaid formerly in the occupation of William Browne or his assigns afterwards of Samuel Browne since of Mary Browne Widow then of Simon Ruse afterwards of Sarah Peachey and William Smith and was until recently in the occupation of the said Sarah Wright. Joshua Cudmore of Peldon buys the cottage in 1892 following Sarah Wrights' death; he buys it from Sarah's son John for £85. He appears in both the 1901 and 1911 censuses living there, although as yet it is unnamed and can only be identified by following the route the census taker follows. Joshua dies in 1936 aged 80 but the house was to remain in his family's possession until his daughter-in-law, Agnes, sells the house in 1970. The house was in his family's hands for 78 years. Joshua was born in Peldon in 1855. His father and mother, Benjamin and Ann first appear in the Peldon census in 1851 living in Mersea Road, Peldon. His father is an agricultural labourer and his mother a tailoress. Apart from the 1881 census, which shows that he was lodging in Distillery Lane, Colchester working as a Maltster's Labourer, he returns to his home village for the other censuses. He marries Harriet in 1896. She was born in Elmstead Market, Essex and in the 1881 and 1891 censuses she is working as a domestic servant in London. She lives in the cottage until her death in 1944. Harriett Cudmore widow of Joshua dies on 23 December 1944. Her obituary appears in the Neighbourhood News for Peldon in the Essex County Standard. LIFE-LONG METHODIST The village has lost a highly respected inhabitant in the person of Mrs Harriet Cudmore, who after an illness lasting only a few days passed away on Dec 23 aged 83 years. The deceased was a native of Ardleigh, but had spent the whole of her married life in Peldon. Her husband, Mr Joshua Cudmore predeceased her in 1936. A life-long Methodist, in earlier days she was a teacher in the Sunday School. Her chief hobby was gardening, and she was a fine judge of flowers and vegetables. The funeral took place at the Parish Church on Thursday, Dec 28, the rector (Rev J R Wilson B A ) officiating ... Floral tributes included one 'from friends at Peldon Chapel and neighbours'. Benjamin Joshua Cudmore Benjamin was born in Peldon in 1899. He appears in the list of Absent Voters in 1918 for Peldon; during WW1 he serves as a wireless Telephone Operator. He is a schoolteacher and dies in 1968 aged 69. He married Agnes Louise and they have a daughter, Joan Ethel Cudmore. In the 1939 register the family are living in Weston Road, Colchester and his mother, Harriett, is living there until her death in 1944. It is likely he and his wife moved to the cottage upon his mother's death and his widow probably remained in the cottage until it was sold to the Avises in 1970. Agnes Louise Cudmore (born in 1894) died aged 82 in 1976; widow of Benjamin Joshua Cudmore. Ronald Frederick Avis and Jean May Avis buy the cottage on 27th February 1970 for £3,500, moving into the village from a cottage in Fordham. For £142.85 they buy an extra bit of garden from the farmer, Robert William Bruton, who owned the field behind the cottage which belongs to Games Farm. They are the owners who change the name from 'The Olde Home' to 'Honeysuckle Cottage. Les and Joan Richardson In the Parish Magazine of July 1983 Lesley Arthur and Joan Richardson are welcomed to the village. Sadly Les was to die in 1984 aged 59. He is buried in Peldon Churchyard and a rose tree was planted in his memory. Joan remained in the cottage for a few years before selling Honeysuckle Cottage to David and Hilary King. Current owners 1991 to the present. The current owner, Hilary, churchwarden of St Mary's tells me that the wooden-framed cottage moved twelve inches in the earthquake of 1884 which explains the fact that it now leans. Amazingly, it wasn't damaged and hasn't moved since! Know All Men By these Presents that I Sarah Linnett late of Peldon but now of the Borough of Colchester in the County of Essex, Spinster am held and firmly bound to Samuel Bullock of Peldon in the said County Farmer in the Sum of One Hundred Pounds of good and lawfull money of Great Britain to be Paid to the said Samuel Bullock or his certain Attorney Executors Administrators or Assigns for which Payment to be well and faithfully made. Bind myself my heirs Executors and Administrators and every of them firmly by these Presents Sealed with my Seal Dated this Seventh Day of April in the year of our Lord One Thousand Seven Hundred and Ninety. Whereas Samuel Browne late of Peldon aforesaid Husbandman deceased was in his lifetime and at the time of his Death seized as of free of and in All That Messuage or Tenement with a yard thereunto belonging with the Appurtenances as the same are situate lying and being in Peldon aforesaid formerly in the Occupation of William Browne or his Assigns afterwards of the said Samuel Browne and now of Mary Browne Widow And Also of and in All that New Erected Brick'd Messuage or Tenement and four Perches of land Late Parcel of the Waste adjoining to the said Tenement with the Appurtenances situate lying and being in Peldon aforesaid formerly in the occupation of Thomas Mitchell afterwards of Samuel Ellis since of Edward Willis and now of Edward Sewell. Andwhereas the said Samuel Browne died intestate and without Issue leaving the said Mary Browne his widow and relict And whereas the above bound Sarah Linnett is Intitled as Neice and Heiress at Law of the said Samuel Browne to the said Messuages or Tenements and Premises and the said Mary Browne to her Dower or Right of Thirds (?) of in and to the same And whereas by a certain bond or obligation bearing Date on or about the Thirteenth day of February which was in the year of Our Lord One Thousand Seven Hundred and Eighty nine the said Sarah Linnett became bound to the said Mary Browne in the Penal (?) sum of One Hundred Pounds Upon Condition that if she the said Sarah Linnett Her Heirs Executors or Administrators should and did Pay or Cause to be Paid unto the said Mary Browne and her Assigns during the term of her Natural Life One Clear Yearly Annuity or Sum of Two Pound's and two shillings at the time thereon mentioned in lieu of her Dower or Right of Thirds of and in the said Premises Then the said obligation to be void otherwise it should and might be lawfull to and for the said Mary Browne to enter upon and take possession of the said Messuages or Tenements and Premises and to hold and enjoy the same until the said Sum of Two Pounds and Two Shillings was fully Paid and Satisfied And whereas the said Samuel Bullock hath contracted and agreed with the said Sarah Linnett for the absolute purchase of fee Simple (?) and inheritance of the Messuage or Tenement Yard Garden and Premises in the Occupation of the said Mary Browne which is intended to be conveyed by the said Sarah Linnett to the said Samuel Bullock and his heirs by Indentures of Lease and Release the Lease to bear Date the Day next before the Day of the Date hereof and the Release even Date herewith (Subject to the Dower or the Right of Thirds of the said Mary Browne therein And whereas the said Annuity or Sum of Two Pounds and Two Shillings mentioned in the said Recited Bond being a Lien or Charge upon the said Estate as well as on the Brick'd Messuage or Tenement and Premises in the Occupation of Edward Sewell and the said Mary Browne empowered (on Non Payment thereof) to Enter and Take Possession of the said Premises so intended to be Conveyed to the said Samuel Bullock and to hold and Enjoy the same until the said sum should be fully Paid and Satisfied the said Samuel Bullock hath requested the said Sarah Linnett to enter into the Presents Bondor obligation to indemnify him againset Payment of the Sum of One Pound and One Shilling the Moiety or half Part of the said Annuity or Sum of Two Pounds and Two Shillings which she hath consented and agreed to do Nowtherefore the Condition of the above written obligation is such that if the above bound Sarah Linnett her Heirs Executors and Administrators do and shall from time to time and at all times hereafter save harmless (?) and keep indemnified the above named Samuel Bullock his Heirs Executors and Administrators and his and their Goods and Chattles and Lands and Tenements of and from Payment of the said Sum of One Pound and One Shilling (being the said Moiety or half Part of the said Annuity or Sum of Two Pounds and Two Shillings Agreed to be Paid by the said Sarah Linnett to the said Mary Browne in and by the said Recited Bond in Lieu of her Dower or Right of Thirds) And of and from all Action and Actions Cause and Causes of Actions Suits Costs Charges Payments and Demands whatsoever that he or they shall or may say Sustain Expend or be Put unto for or by Reason or Means of the Nonpayment of the said sum of One Pound and One Shilling or Moiety or half Part of the said annuity or sum of Two Pounds and Two Shillings or otherwise howsoever Then the above written obligation to be Void otherwise to be and Remain in full force and Virtue. From the Deeds of Honeysuckle Cottage. Transcribed by Elaine Barker. Title: Will of James Peachey of Peldon contd. Witnesses Mary Ann Hewes, Fredk. Hasell Newell S. Solr. Colchester. Will proved in the Principal Registry of Her Majesty's Court of Probate on the nineteenth day of July 1861. Testator died fourth of August 1860. 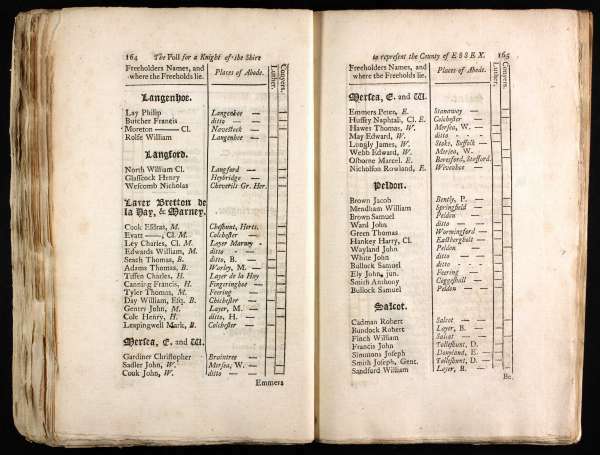 Title: The Poll for a Knight of the Shire to represent the County of Essex, pages 164 and 165. Wescomb Nicholas ; Cheverils Gr. Her. Seach Thomas, B.; Layer Marney, B.
Adams Thomas, B.; Warley, M.
Gentry John, M. ; Layer, M.
Cole Henry, H. ; Layer, H.
Sadler John, W. ; Mersea W.
Hawes Thomas, W. ; Mersea, W.
May Edward, W. ; Mersea, W.
Webb Edward, W. ; Mersea, W.
Brown Jacob ; Bently, P.
Bundock Robert ; Layer, B.
Francis John ; Tolleshunt, D.
Simmons Joseph ; Donyland, E.
Smith Joseph, Gent. ; Tolleshunt, D.
Sandford William ; Layer, B.